Widely considered to be the next-generation of clinical exfoliation needs, AlumierMD Peels are available in a wide variety of formulas and specifications. In all instances, powerful ingredients are combined to have a remarkable purifying effect on the skin, while at the same time boosting its health, strength and general wellbeing. AlumierMD Peels can be fully customised to suit the exact requirements of each individual, ultimately delivering radiant, soft and luminous skin in a matter of minutes. 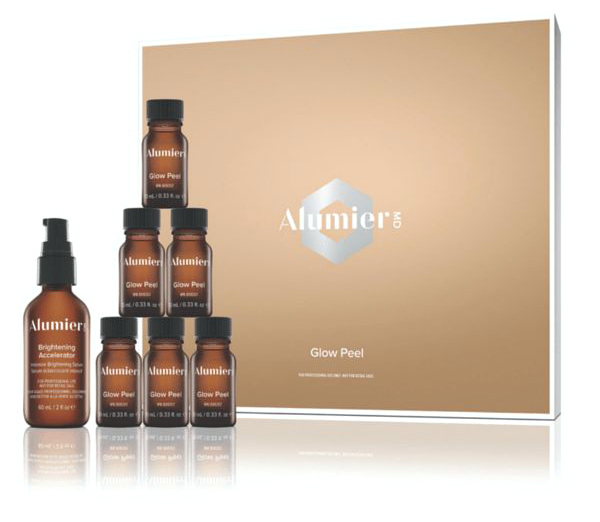 AlumierMD Peels have been proven in their effectiveness in calming redness and inflammation, reducing the appearance of fine lines and wrinkles, combating hyperpigmentation, exfoliating dead skin cells, promoting skin renewal and generally rejuvenating the skin after a single application. Safe, affordable and suitable for the vast majority of skin types. Glow Peel combines lactic acid, salicylic acid and resorcinol, creating a multipurpose resurfacing solution effective in minimizing the appearance of fine lines, wrinkles and hyperpigmentation issues like age spots, discolouration and uneven skin tone. This formula exfoliates dead skin cells and stimulates cell renewal. To suit individual needs, Glow Peel can be customized by strength by numbers of layers. Detox Clear contains salicylic acid and lactic acid for excellent pore penetration and exfoliation. Salicylic acid penetrates into the pore and exfoliates dead skin cells and excess sebum. Lactic acid exfoliates dead skin cells and hydrates. Eucalyptus provides strong astringent properties. Together, they work to smooth skin, minimise pore size experience, reduce acne and prevent new pimples from forming. Deep Moisturising Treatment is an intensely hydrating and nourishing option that infuses antioxidants and moisture binding ingredients resulting in plump, soft skin and a dewy complexion. This customised treatment also includes the application of targeted treatment serums to address your individual skin concerns in order to provide the optimal result. AlumierMD Refining Treatment is a highly effective treatment to refine and purify the skin. A unique blend of clay and exfoliating ingredients removes dead skin cells and promotes skin renewal while clearing trapped oil. This unique experience also includes brightening enhancers, followed by targeted treatment serums to address each skin concern. The result is a reduction in the appearance of blemishes and excess oil, while soothing and maintaining hydration. Visit us to discuss your skin in depth and work out a treatment plan or products to help you achieve your best skin!